Blog > Amy's inspiring postcards! These are so beautiful! What a treat for those who are lucky enough to receive Amy's cards. I enjoy making my own cards on the computer combining my own photos of birds, furry friends or my pets in collages to make it more personalized. And if the person asks for something specific like an airplane, I try and make the card with that on it. I think that when people say they don't want hand made cards, they are really missing out. Store bought cards are never as unique and personal as the handmade kind which are made with creativity and love! Amazing! I'm not a very "crafty" person myself, so only send store bought postcards and tend not to decorate them much. On the other hand, that's exactly why I find people like Amy such awe-inspiring. And that's also why I could never imagine putting "please no homemade cards" in my profile. So beautiful. I would be honoured to get one of these cards!! Gorgeous! I'm so impressed. There's so many creative people on this site. I would be honored too to receive one. I love to make and send my handmade cards ,but a lot of postcrossers put on their profile they do not want handmade ones, I do not onderstand why .I receive mostly very positive comments back ,so i wil go on. I love your work Amy! They really look amazing. The people receiving them are really lucky. And I also love this is covered here. I've never received a handmade card but prints of own art twice. And I love it. My recipients often exclude handmade cards as unwanted, which is kind of sad. I'd value someone creating a card for me and taking time to make it alot. Awesome! You go girl! Keep it up, it makes the world more colourful. I am sadly not creative but I too would love to have one of these awesome cards. I do try and match up instead one of the items off their profile if possible and I always write a lot but this is special. Keep on giving cheer to people with your unique cards. You are in a super league of card making. It's beautiful !!!! 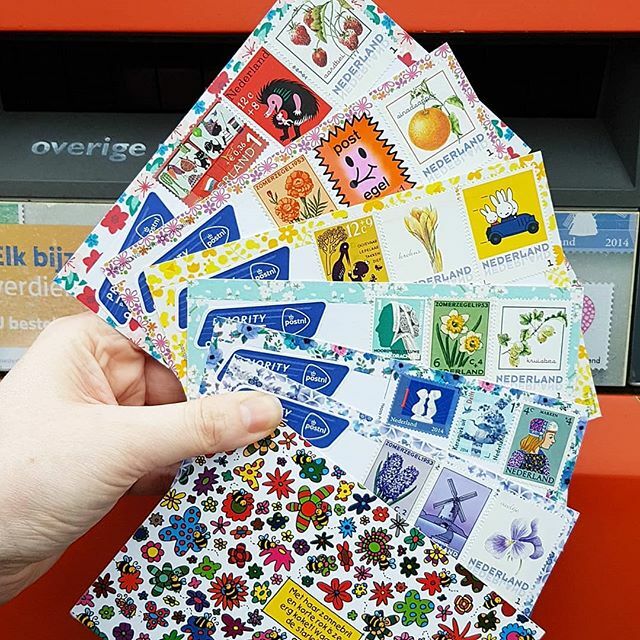 Dutch stamps are amazing !!!! I hope that we will one day receive a postcard from Amy ! I love colorful cards and creative people ! Love these cards Amy, keep blessing people with your creativity. I use washi tape & puff hearts, smiley faces etc. I like to thank the postman on each card. Decorating the back is fun! Thanks for this article, really nice! The postcards are done beautifully! What I really like about them is that Amy has left some room to actually write a note to the recipient. That's important to me. I like to make one-of-a-kind cards for those who request 'handmade'. This hobby has so many creative and generous members! These are so pretty and I wouldn't have thought to decorate mine that way. I'm going to try it next time! Hi Amy, Ik vind je kaarten collectie helemaal geweldig. Als ik al die kaarten zie ben ik weer terug in ons "oude" landje. Ik hoop dat ik ooit een kaart krijg van je, zou leuk zijn. Hi Amy, I think your collection is amazing! When I look at your cards, it bring back memories from the country where I come from. I hope to receive one of your cards, that's nice. Now am rethinking of how I should make my cards unique and beautiful as Amy's.... it just might unleash the artist in me! I only decorate cards when the user asks for it on the profile. That's because I've see people complain about decorations (on the forum and on the profile). I would love to do it to all cards, but some people can get really grumpy about things. When I do decorate, I use mostly stickers and rubber stamps. I have Washi tape, but I can never get it on straight. Also, the US postal service has strict rules about things like that, and it seems that Washi tape impedes the processing of the cards. These are so lovely, Amy! I don't decorate the postcards I send much, mostly because I usually fill it with my (admittedly terrible) handwriting. Occasionally I'll have a gap or space I might add a little sticker to (usually to cover up a barcode if the stamp doesn't do that) but on the whole I prefer to receive postcards full of stories and such so that's how I send them out. If it's a card I've made myself I still don't really deocrate the back, since I did the front anyway! Dear Amy, congratulation for your creativ work I love it. Oh how nice her card are! Sometimes I also use washi tape and stickers on postcards, but only if I think the recipient will like that kind of things. Sometimes I draw something, for example some plant inspired thing to separate the address area and the text on the card. crafty and creative! send me a card please! I love your pretty washi borders! Washi is always an after thought for me and I use it to fill in left over white space but I might start doing a border on the larger cards that can support the loss of space! Very nice cards!! I was really surprised with this method of decorating postcards. If I had enough money I would send my postcards exactly like the examples of this Postcrosser. Sometimes, however, I decorate my postcards the way I can, because the most important for me in Postcrossing is art and I qualify a postcard for all its artistic iems. Another way to add color is to use thin tip sharpies (markers that are water 💦 proof) to write the text on your card. I use this along with Washi tape, stickers, and fun stamps. (I found an antique store that sells old stamps at face value.) You can create a fun explosion 💥 of warm greetings that are fun to receive. I started following Amy on Instagram long time ago because I love her way of decorating postcards and it's inspiring for me.. I didn't know that she's a Postcrossing member! And now I found this interview here!! It's amazing!! Keep going, Amy!! Well done! I always love it when Postcrossers put extra effort into the postcards they send to me. That inspires me to slow down and take time with the details. These are so lovely! Good job, Amy! Your cards are beautiful, Amy. I hope my name drops down on your list one day. What the beautiful cards! For my cards, I search for the stamps that the receiver love from their request lists of cards. Then, I use my tidy handwriting and attach the address from the website. Sometimes when it's the receivers' birthdays or special occasions, I also attach the small gifts from my country and/or decorate the postcards and envelopes. What an inspiring post! Thank you for sharing, Amy. I, too, love decorating my postcards and look forward to trying some of these happy, creative ideas! We postcrossers are an artistic bunch, which is a great part of the joy in postcrossing. I love to decorate the post cards I send. I use washi tape, stickers and card making stamps, sometimes I try to draw specific items on the card such as lighthouses, hot air balloons and whatever the person likes. I use pinterest to look for ideas (under journal images). I love getting post cards with that extra touch and I have received quite a few, we have many talented people on this site!! amyvnwijk's cards are inspiring - sending beauty all over the world! Kudos! Wow - love the decorated postcards - they are so pretty. Thanks for sharing. Amyvnwijk's cards are so beautifully decorated that I have been inspired to try some of these designs on my next cards. I love Postcrossing and get a lot of joy in receiving lovely decorated cards. Thank you for sharing. i wish i could have one!!! I do the exact same thing, just not on all my cards. :D I know not everybody likes decoration and I'm not always in a creative mood either. I usually try to match the tapes I use to the user's preferences, or I colour-coordinate as well. But if I know I'll have a lot to write, I keep the decoration to a minimun so as to have more space for a message. love love love that you interviewed Amy, Iv always admired her cards from IG. Prachtig! I wish I would get one of those. I don't mind homemade cards at all. I love seeing someone else's creativity. Geweldig om dit hier tegen te komen! Ik volg je al een tijdje op Instagram en ben zo fan van jou feed! Leuk om te zien hoe jij je creativiteit in de ansichtkaarten verwerkt! I follow her on Instagram as well and always think her photos are so colorful and joyful! Glad to see them here on Postcrossing! Her stamps are so cool! Where do you buy such stamps? Mine are just the USA ones with the moon and some with the flower. ?? I LIKE WASHI TAPE TOO!! I don't do as much with it as her, and I certainly don't have as much!! Sometimes I just do a straight line of washi tape down the bottom or the top or even down the center. I wish more people did that to their cards, I will start to work a little harder to make my cards beautiful and I encourage all fellow postcrossers to do so! Think of if everyone did that then every postcard you received would be brimming with happiness and color!!!! But seriously, help me out with stamp thing PLEASE. Hello Amy, this looks absolutely wonderful and colourful ! 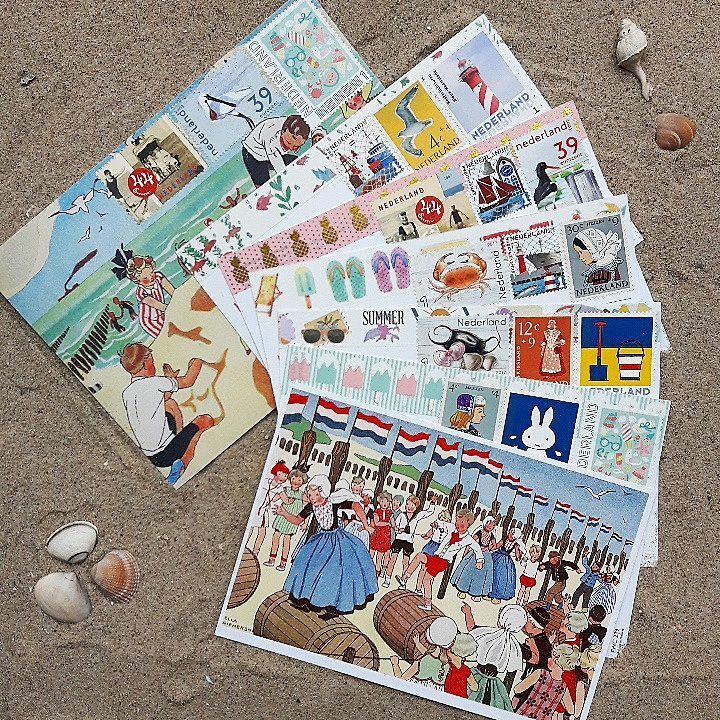 I used to correspond with people all over the world, before internet, before postcrossing, and I Always decorated my letters and envelopes with matching stickers, photo's, pics and decorations out of magazines, etc. I liked doing it. Now, with postcrossing I try to add some personal touch and your decoration surely is inspiring. Leuk interview ! Veel groeten uit Zuid-Limburg ! Peter. I really love creative talent. Really lovely, Amy! I think a lot of us decorated the postcards/envelopes, it would be great if someday we can share all our work at least in a post, that would be great, a lot of art get lost..sadly. WOW ! really love these creative postcards! Beautiful cards! So creative! I hope I get such a great card! What a nice treat to receive a card so thoughtfully made. Thanks for the inspiration! @SunshineCece : Different countries issue different stamps. 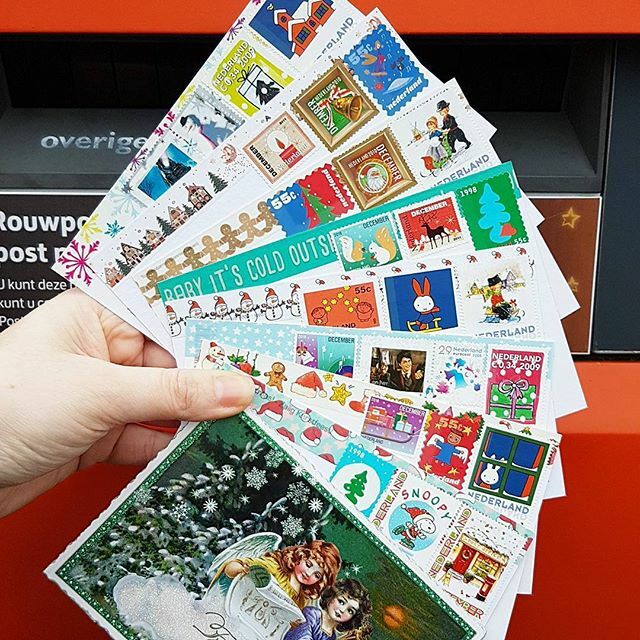 To use the same as Amy from the Netherlands you'd have to mail your cards from the Netherlands. 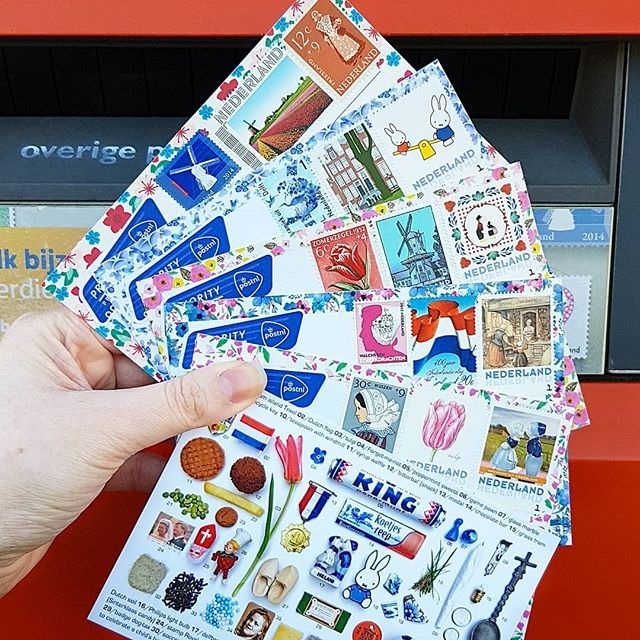 But in the US you can also use many old stamps. They are very beautiful too! I received many postcards with many different stamps from the USA so far. You just have to make sure that their value adds up to your current rate of postal fee. I love her use of postage stamps! so beautiful. Thanks for sharing! Oh my god! Such a great dedication indeed..I wish I could come across your beautiful works, Amy. Love them all! @SunshineCece : I sent you a personal message through Postcrossing on where you can buy lots of different beautiful and colorful U.S. postage stamps, both current day stamps and vintage stamps. Have fun! Enjoyed hearing about Amy...and she appears to be quite organized, too. 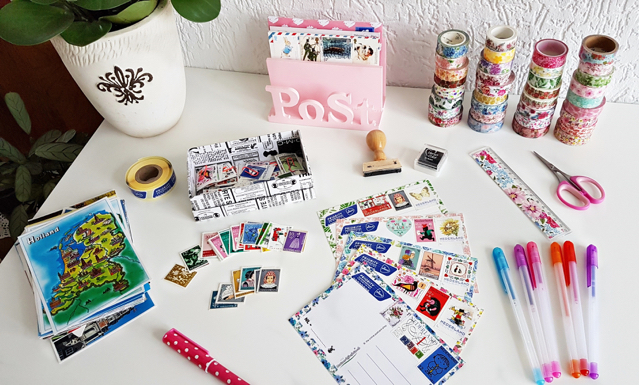 (Wish I had such a neat space to prepare my cards) Yes, we do indeed have some very creative, dedicated, talented, inspiring, thoughtful people in our Postcrossing world. And I think sharing the stories brings us all even closer together. Bravo. Your cards are great Amy! these are so beautiful and happy and fun, thanks for sharing! i would love to do an exchange if only if only.... what inspiration you've provided me! Yes!! I'm 46 and still love glitter and shiny things on my postcards! If I can't match a postcard to a person, I usually have a large enough assortment of stamps to try and fit the profile. I'll admit I also have tons of Washi tape, too. By the time I put all the stamps and tape on the cards, there is no room to write, haha! Nothing as colorful and creative as this, though! I hope to receive a postcard from Amy, too! Amy, your postcards are absolutely stunning! Keep going! I'm fond of decorating postcards I send as well, but maybe I don't use much washi tape yet - only with weekdays maybe. 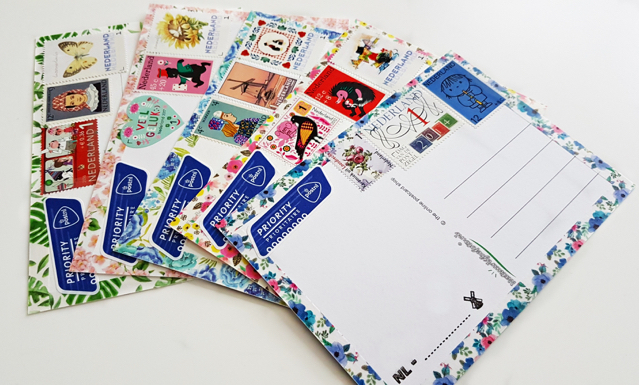 I write quite large messages so I have to control myself a bit because I want to decorate each card with 2-3 stickers, even if they're just "Air mail" or "Thank you postman!" Usually I choose a sticker with a mailbox, but it depends on what my fellow postcrosser wants to receive. Ziet er leuk uit, maar plak jij niet te veel aan porto-kosten op? My name is Salim and I am from Algeria. I like so much decorating my postcards with different nice stamps and different colours of pens .i also write few words in Arabic. I also print the postcrossing logo from the website with its real colours. And I sometimes stick the Algerian flag . I'm ready to swap decorated postcards with any one. Just contact me . Wish you all the best and enjoy postcrossing and your life.